Many of you want a friend or family member to officiate your wedding. Weddings staged at fayres showcase the latest rings, bridal gowns, grooms attire and marriage trends. But, do they give you enough information about staging your own big event? Basically, couples who desire thoughtful and sincere sentiments at their wedding, assign the task of officiant to a dear friend or family member. That’s an honour, a lot of responsibility and a big job to fulfill. Plus, on the flip side of things, the person you choose needs to know how to act. And be up-to-date about mock wedding formalities, so that the ceremony looks and feels authentic. Secondly, tell me wouldn’t it be wonderful to have your mum or someone who “gets you” officiate your wedding ceremony? But, how do you fulfill your wishes and host a personalized event? Well, to start with you’ll need a practical guide and a coherent script for the special occasion. Thirdly, you need to be acutely aware that your relative or friend can officiate your wedding and what is even more exciting for less than the registers fees. Therefore, have a modest civil wedding first and a big celebratory ceremony afterwards. But, they can only guide you through a symbolic or non-religious marriage service. The next step is your big day and that probably feels quite surreal. Yet, the question is who will conduct the ceremony. Once you’ve decided on your officiant. You’ll need to create a dialogue within your wedding speech to explain what your relationship means to you. So, build trust and easily convey your wishes for your special day. At the end of the day, the officiant has an indispensable and valuable role to play as emcee. By uniting your guests, everyone feels they are part of your event. In addition, they can narrate your storybook wedding, announce your arrival and exit of the venue. Pop over to Fab weddings.com and use their tool to create the perfect script, program and vows. In addition, the wedding guests want to hear everything. Therefore, the officiant’s voice should be amplified over a P.A system. Use a cordless microphone (or headphone). And too make life even easier you can inquire about this at the wedding venue. This will ensure that your vows and speeches are audible. 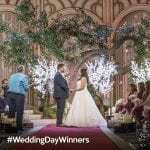 Let’s face it, the officiant’s responsibility is to connect with you and your wedding guests. Therefore, he or she should dress to impress, look and act the part. This means they need to acquire an appropriate outfit. As a matter of fact, they need to wear something that brings out their personality. Another thing to know is a personal celebration of love is a special celebration. And, you could like the idea of a loose and unstructured ceremony. But, whatever wedding you are planning, it’s paramount to have the right running commentary. Inevitably, your master of ceremonies will make your dream day run smoothly, be perfect and fun. In the likelihood you’ve found the right person. Or if you choose a dear friend to officiate your wedding you keep in with your personal wedding wishes. Most importantly it reflects the values, cultural heritage and beliefs you both hold. What’s more, you create a wonderful offbeat event. Let me share something with you. As a master of ceremonies and wedding officiant I have lots of rehearsals. And record my voice in order for my public announcements or personal speech to sound smooth and not choppy. And I do my best to compose yourself. Another thing, they should embrace their own body language. And improvise and feel confident during the festivity. Your MC’s overall approach will echo the wedding or party event, because they represent you. Here are even more powerful body language tips for being the best master of ceremonies your friend can be. To conclude, mock weddings give you the opportunity to officiate your own wedding when you want, where you want and how you want. And the key tip for a professional presentation is to create a script, cue or note cards for your officiant. This will be of great use during your ceremony and ensures no hitches along the way. Find out how to make and use them effectively at www.write-out-loud.com.